When you want to change the screensaver on the computer, you should consider an app that gives you some room to customize the way it is displayed. Flurry screen saver is a nice utility that should keep you entertained. The app has a clean interface that should be easy to figure out by all users. As the name suggests, Flurry screen saver is an animated app that covers the desktop once the computer goes idle. 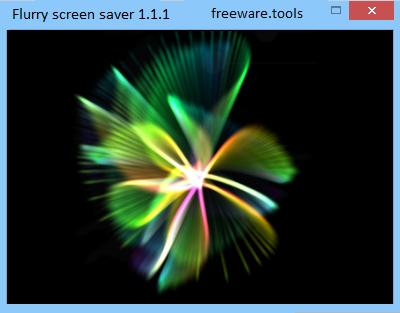 The standard Windows screensavers are pretty dull, and Flurry Screensaver is a great free addition to that collection. In other words and simply stated, Flurry screen saver is a beautiful screensaver for your desktop. Installing is simple - you unzip the folder, then right-click on the Flurry.scr file and choose 'Install'. That will open your normal screensaver settings window, so make sure you pick Flurry from the menu. To test the file without installation, simply double click Flurry.scr. Alternatively, to set this utility as the default screensaver you must access the Windows settings menu and pick the name from a drop-down list. By clicking the “Settings” button on the interface, you can access the app’s configuration menu. There are several types of flurries that can be picked from a drop-down list. For instance, “Classic” is the default appearance, while “RGB” displays a faster-moving flurry that often changes color. Other options are “Water”, “Fire” and “Psychedelic”. If you have multiple monitors connected to the computer, the screensaver can be set to cover the entire desktop, only the primary monitor or a new type of flurry may be assigned to each monitor. There are also some rendering options, such as “Single buffered”, “Lady double buffering” and “Accurate double buffering”, depending on the speed. All in all, Flurry screen saver is a nice app that can visually enhance your desktop. Inexperienced individuals shouldn’t have any problems with installing and customizing the tool, thanks to the intuitive layout and the overall simplicity of the task.